Peter Rowe struck 122 not out for Ketton Sports at Wisbech. Barnack still have a bit of work to do to complete their Rutland Division One and John Wilcox Trophy double. The villagers were inactive yesterday (September 2) enabling Bourne to pass them at the top of the table following a one-wicket win at King’s Keys. Bourne’s lead is just five points and they complete their fixtures at Grantham on Sunday (September 9). 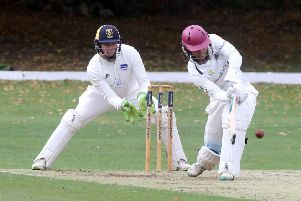 Barnack have three matches left starting with a tricky one at in-form Peterborough Town this weekend and Ketton Sports are not yet out of the running after bashing deposed champions Wisbech by 82 runs yesterday. Ketton are third, nine points behind Barnack having played a game more. Dan Bandaranaike (61) was the batting star for Bourne yesterday, although they almost made a hash of chasing 149. Playing with 10 men didn’t help, but Bourne eventually scrambled home. Henry Brewster and Sam Evison each picked up three wickets for Bourne. Pete Rowe batted throughout Ketton’s 272-6 to make an unbeaten 122. Tom Sole (94) put on 149 for the first wicket with Rowe. Town eased to a six-wicket success at struggling Oundle as teenage slow bowlers Karanpal Singh (4-50) and Mohammaed Saif (3-5) impressed as the home side werre shot out for just 94. King’s Keys 149 (M. Anjum 40, H. Brewster 3-27, S. Evison 3-33, T. Dixon 2-13). Bourne 150-8 (D. Bandaranaike 61, S. Evison 28, S. Chaudhary 3-19, S. Amir 2-34). Oundle 90 (J. Bolsover 28, K. Singh 4-50. M. Saif 3-5). Peterborough 94-4 (D. Malik 23no, S. Subramonian 21no, J. Charlton 3-36). Ketton 272-6 (P. Rowe 122no, T. Sole 94, R. Vitas 24no, W. Pretorius 2-31, J. Dunning 2-65, G. Freear 2-65). Wisbech 190 (D. Haynes 43, T. Jupp 28, Z. Manzoor 3-35, P. Rowe 2-11, T. Sole 2-29, S. Mahmood 2-42).